ALWAYS A CLEAN TITLE AT FORREST MOTORS! 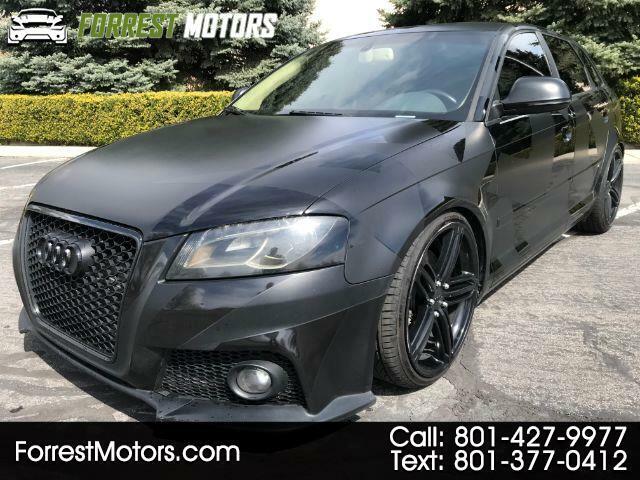 - ALL WHEEL DRIVE - CUSTOM 1 OF A KIND AUDI A3 - QUATTRO - AWD - TURBO - NAV - BACKUP CAMERA - LEATHER - SUNROOF - BLUETOOTH - ALLOYS - SUPER CLEAN - CLEAN TITLE and CarFax shows EXCELLENT service and maintenance history on this nice car. Custom paint accents. Upgraded adjustable coil-over suspension that allow you to set the ride height right where you like it. Front mount intercooler and performance cat-back exhaust. This car has really been taken care of and is in above-average condition for its age and miles. It drives beautifully and everything is in good working condition. Many features including CD, Bluetooth, USB and AUX inputs, keyless entry, alarm, steering wheel controls, and much more. Enjoy a fast and fun sports car with very unique customization that will have you standing out in a crowd of sameness... in just a few days of having it here, multiple people have stopped in just to admire the very unique look. With almost 18 years in the business in Utah County, come see why we were named Orems BEST USED AUTO DEALER. Stop by anytime during our normal business hours 10-7 Monday through Saturday or visit us online at www.forrestmotors.com and view the CARFAX vehicle history report or fill out a finance application to gain access to the lowest interest rates in town (OAC) through one of our preferred lenders or the bank or credit union of your choice. Come see why so many people are already driving a quality used car from Forrest Motors and referring their friends and family to us. We hope to serve you soon.